and my prayer came in unto Thee, into Thine holy temple." and once again, you prayed someone through, dear friends! just how awesome our God really is? Guess where Jakob Cooper is tonight??? You have joined in the battle by praying faithful prayers. Now, please join in the victory by giving praise to our Almighty God!! He has surely worked a miracle on this young man. You can read more details by visiting the Prayers for Coop Facebook page. I just read this update about Baby Daxton, and it broke my heart. I was so hoping for better news. PLEASE keep this dear baby and his parents and family in your continued prayers! "Our little Dax is two weeks old today. I look at his little face everyday and feel so blessed to have another day with him. But I also feel heartbreak. Heartbreak like only a parent can feel for their suffering child. This has been one of the hardest things I've ever had to do in my entire life. the neuro doctor told us we can expect Dax to have some form of cerebral palsy. What degree has yet to be seen due to how small he is and depending on how he develops. and he will still be able to learn and do some things. They also told us that with the small brain bleeds continuing, it was far too risky to the rest of his healthy brain tissue to do his "switch" surgery on his heart. There are still a lot of unknowns right now. We have to talk to his heart doctors in the morning and see what they tell us. I'm begging everyone to continue to pray for our Dax. his grade 4 bleed stops evolving, and he doesn't get any new bleeds. He needs his heart surgery. He can't go on much longer without it. He's such a special little boy, and he needs all the prayers and love he can get. I also want to continue to thank everyone for their prayers, love, support, and donations. You've all been a tremendous help to our family. Please continue to share Daxton's story. Thank you so much, we love you, & God bless!" but we know Who is in control. How many times has He proven that His power trumps medical science? We have seen what He can do, and we are believing Him to send the miracle this baby needs. Please pray for his dear parents. I can only imagine how exhausted and emotionally drained they are feeling by now. All this, after just giving birth....this dear mother! My heart just breaks when I think of them. God bless them and hold them extra close to your heart tonight! To read previous posts about Daxton, click the links below. The family lives four hours away from the hospital. You can also keep up with the family's updates by clicking the Prayers for Daxton Gage Facebook page. How are you, dear reader? Does it feel that you have reached the end of your endurance? Sometimes, human help just isn't enough. the anguish, and the fear. than any other person ever has...or ever will. Jesus loves you, dear, hurting one. open-armed, with more compassion than you could ever imagine. Empty your heart to Him. and we are more than happy to pray and to help bear your burdens to the Throne of Grace. I will be praying for little Daxton and praise God for Jakob! I ask for prayer for myself today. God has shown me an area that needs His wisdom and power, an area I know He desires to change by His power. I pray that I will listen to the Lord (and my husband who sweetly brought this area of need to my attention. Please pray I will not pity myself or condemn myself, but honestly seek the Lord to renew my heart and my obedience to Him and my husband. Please pray for me and my family. Dear Shirley, Bless your dear heart! I am praying for you. God is able to do exceeding abundantly above all we can ask or even think! Ephesians 3:20 I know God is going to help you through this and bring you out on the other side with victory! Always feel free to email me anytime you need to talk. Much love to you, sweet friend. :) Keep looking up! Jesus is with you. As for Daxton, I am really having a hard time with his story. Of course I will pray, but it just hits so *close to home* right now that my heart just breaks. Sometimes I just wish that God would *fix* everything sad and bad in the world. And when I am most desperate for His rescue, sometimes I forget this Truth - He did indeed fix everything on that Cross. Oh that I might never look anywhere else. Dear, precious friend, I know exactly how you feel. Keep encouraged, and know that God is in complete control, and He is watching over you and everything that is touching your heart and life. I am praying for you often. Keep looking unto Jesus...YES, He fixed it all on the cross! Praise His wonderful name. :) Much love to you. Cheryl, such wonderful news about Jakob . . .
Sweet baby Daxton . . . he is in my thoughts and prayers; may the Lord give him and his family a double portion of grace as they face this difficult trial. That's wonderful news about Jakob... the news for little Daxton is heartbreaking. I'm praying for him and his parents. Thanks for the update and I pray blessings upon your ministry, sister. Hello, dear Cheryl. Such good news about Jakob, and I will be praying for sweet baby Dax. But you asked for prayer requests and I have one. You see my family and I waited for a new baby for 8 years. Well we finally got that new baby last year. But then, last September, my baby sister, Leah died. Would you please pray for me? I am just 16 and my faith in Jesus is rather new. I am still struggling to overcome this horrible tradegy. I loved her sooo much and then she was snatched away from me. What made it worse was then I had friend who were mean to me and told me things that broke my heart. Like I couldn't take care of a baby, etc. I don't want to seem like a pity party, but my grief is real, as is my love for Jesus. Thank you! Thank you, thank you!!!! Your prayers mean so much to me, dear friend!!! I would love to email you, but I don't have an email or google account so perhaps we can just talk through commenting. It feels so comforting to have people like you who encourage me so. I am so used to NOT talking about my precious little one, that it helps to me to heal a little easier. That way everything doesn't stay bottled up inside me. My "friends" have wounded me, but through Jesus, I have forgiven them. I was mostly angry because it had to do with Leah. Yes, Jesus has comforted me! I believe that He brought this severe testing of my faith to strengthen it and bring me closer to Him. My love for my Saviour has intensified, and I am on my way to memorizing whole books of the Bible! My tears have been many, and I feel He has cried with me. And you know what the very hardest time was for me? Thanksgiving. That was before the change in me had begun, once the shock had worn off. I cried the very hardest that night, and slept with the little blanket I had made for her. Oh, I won't bore you with my sad tale. Please continue to pray for me, Cheryl. I know my 3 sisters are in Heaven with Christ, and what more could I ask? But as the saying goes, the more you love, the more you grieve. Thank you!!! God bless you for caring! My, you have suffered such losses, Hannah. 3 sisters! I am SO very sorry, and I pray that you feel the comfort of the precious Holy Spirit in every moment of grief. It blesses me to read of how your experience with Jesus has deepened through your trials. Sometimes, we spend our most intimate hours with Him when we are experiencing the hard places of life. God bless you, sweet friend....you feel free to write to me anytime, and you can count on my prayers for you. If you ever get an email address, you can email me through the "about" section here on my blog. Thank you for your prayers! I am thankful for people such as you. I spoke of certain friends who were mean, but I must say that I did have a friend who stood by me through this whole process. Grace was always there, she always listened to me, and visited the graves of my siblings with me. We would kneel and pray, and I would feel so comforted! I know God sent her into my life to help me and to be a support that I could lean on. God bless her! I could never praise my Lord enough for all that He has done for me! Some would say that God doesn't care. The thing is, it is that God "allows bad things to happen". It's His enduring promise, that when things like this do happen, He will be WITH US. Oft times, the Lord uses things like this to test or strengthen ones' faith. Also, pray for some dear friends of ours! Six months before Leah died, two of there children (Elise-3 and Enoch-6 wks.) drowned in a car accident. They are still grieving and need prayer. You can find their Facebook page- Elise and Enoch memorial. When I said I lost 3 sisters, let me clarify. My older sister, Sarah, died before I was born, and then mom had 2 miscarriages and we just say one was a girl and the other a boy, and then most recently, my youngest sister. I hope I am not bothering you commenting so much. Well, I thank you for praying for me! God is with me, and I pray He blesses you! Hannah, I am so thankful and happy you have Grace to walk through this valley with you, sweet friend. Thank you for clarifying your situation with your sisters. Your dear mother! She has suffered much grief, also. My heart goes out to her, too and to your friends who lost the two little ones to drowning. There is SO much grief in this life, but thank the dear Lord, one day we will all be in Heaven, where no tears will ever dim our eyes, and no sorrow will burden our hearts. God is with you, dear Hannah. Please keep encouraged and looking to Jesus! You are NEVER bothering me...you feel free to comment and write to me any time. I am continuing to pray for you, and I care. :) Let me know how you are doing when you get a chance. Much love to you. Praise the Lord for the great report-God is good. Praying right now for sweet little Daxton. Visiting from Sharing His Beauty. Praying for dear baby Daxton! Such a time they are having! I am praying for little Dax and praising God for Jakob's progressive healing! I am also continuing to pray for the need you shared. I trust the Lord will right that situation for His glory in His time. Thank you for sharing them so we can come alongside these precious souls and the families. God mightily bless you today! Thank you SO very much, sweet Jacqueline! It means so much to know that you are praying for these needs...and for my personal requests, too. I could never thank you enough. God bless you for stopping by, for your encouragement, and for your faithfulness to pray. Much love to you! Its been quite awhile since I've been on here but... Well, I'm here now. Anyways, to catch up in the loop, I went back and read the original posts on both Jakob and baby Daxton. I'm glad to hear that Jakob is healing well from the accident, iwill pray that he continues to recover. And as for Daxton, that poor little baby and his poor parents. Such a sad situation. I will pray for his recovery and continued strength for his parents. I still continue praying for all of the other ones that have been mentioned on here prior. God bless them all. Also, May God continue to bless you, Cheryl. You have such a wonderful, caring heart. Prayers for this beautiful baby! Praise God for Jakob! 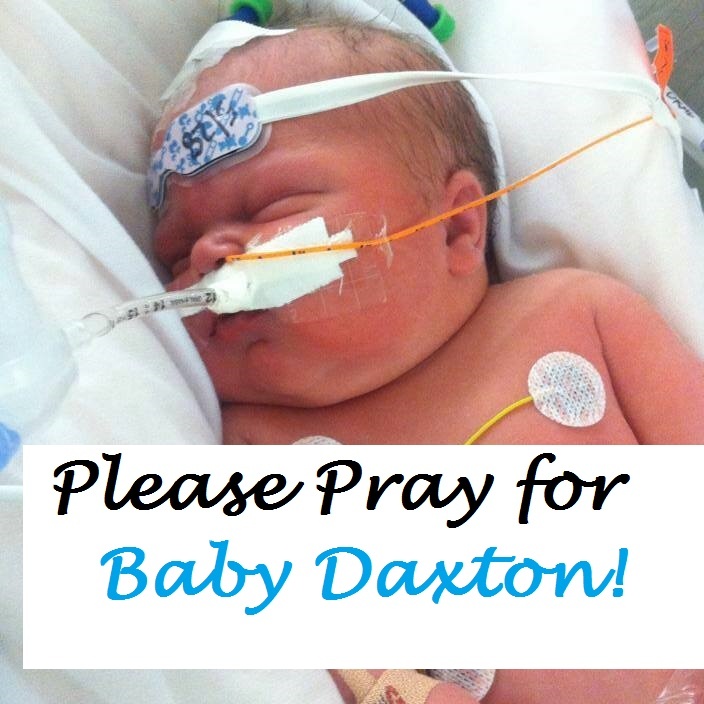 As for baby Daxton, we continue to mention him in our prayers and God will do like He has done for Jakob. Much love sis! 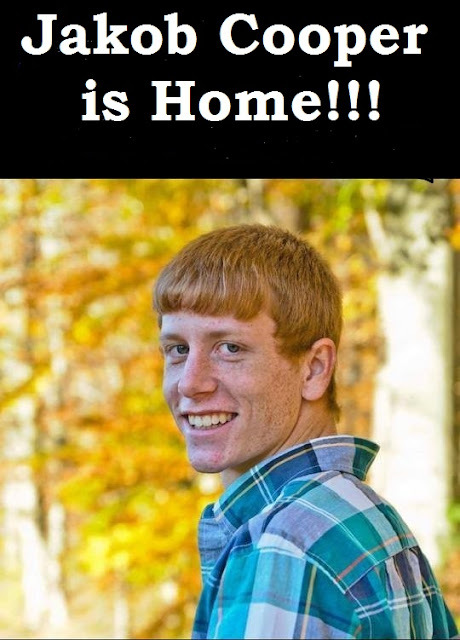 I am so thankful that Jakob is home which is a good sign. Lord we place baby Daxton into your arms as you are the Good Shepherd and care for your sheep. Bless the family and encourage them and bring them peace and a spirit of Calm. Grant special wisdom to the doctors who are involved in the care of this babe. Thank you Cheryl for the updates and for sharing with us here at Tell me a Story. Thank you, dear Hazel...your visits and support and encouragement and love means so very much! May the Lord bless you for all you do for so many of us. Praising God for Jakob's journey home. I'll continue to pray for him and baby Daxton too and the parents. I came in contact with two young women, Kristen and Abbey, who long for a baby and feel discouraged. Both early 30's. I love to pray for this and somehow feel joy for them when I do. They're both close to me. I mention it because you're my go to girl for miracles in this. Please help me pray! Oh, dear Mary! Your words always touch my heart! I can't thank you enough. I will add dear Kristen and Abbey to my list to pray for. Please let me know when their miracle comes! I am still praying for your Amy and believing God for her miracle, too. :) Love you, sweet friend. Thank you Cheryl for sharing this praise report on Jakob, what a wonderful blessing for him and his family. Thank you also for the opportunity to pray for baby Daxton and his family. Thank you for sharing this with us at Good Morning Mondays. You have such a heart for others and you are such an example for all of us. Blessings dear friend.